Siesta Key and Sarasota offer a wide variety of fishing opportunities and you certainly don’t need to be an expert to have fun fishing from the beach directly in front of our condo. If you want to step it up a notch, or learn from an expert, you can charter a fishing boat and captain. With an experienced captain you can explore the quite bay waters in search for Snook, Snapper, Trout and the many other fish you will find there, or go after 100 pound plus Tarpon in the Gulf. If you hire a licensed captain you will not need to buy a fishing license. If you are fishing on your own, you can read about regulations and license requirements by clicking here. For more pictures, please see our Photo Galleries. Bayfront Marina rents fishing equipment for $10 per day. Bayfront Marina is right behind the Turtle Beach Grill – follow the road out of Fisherman’s Cove to Midnight Pass and you’ll see the Turtle Beach Grill across the street and a little to the left. When I called Siesta Key Marina I was quoted $15 per day. CB’s Saltwater Outfitters, which is less than three miles away from the condo (on the Siesta Key side of the Stickney Point Bridge) rents fishing equipment, but only when you rent a boat. When going to CB’s from the condo, turn on the street immediately north of Captain Curt’s before you get to Stickney Point Rd. – it is easier access, and you can go into the back door at CB’s. Siesta Key Marina, which is right by CB’s, rents fishing equipment for $15 per day. A better (at least lower cost) alternative for recreational fishing is to buy a low-cost spinning reel and rod combo from Wal-Mart (there are several locations, but the one on 13140 S Tamiami Trail in Ospry has the best selection of fishing equipment). This Wal-Mart location commonly stocks a nice light-weight combo from Shakespeare that is usually priced at about $15 and offers heavier weight combos for a similar price*. These combos are not rated for salt water use, but if you rinse them daily, they will easily last several weeks – maybe more. * The fishing line that is included with the Wal-mart combos is not very good. I suggest buying good quality line and rewinding the reel (Spider Wire is available at Wal-Mart, or you can buy line at CBs and they will wind it for you). 12lb test SpiderWire is pretty tough and will do for most of what you’ll catch from the beach. However, while it may seem counter-intuitive, you should pair it with a 50lb test mono or steel leader. Some ocean fish have teeth and others have sharp gills that will cut thinner lines. If you want a bit more assurance you should consider using 20lb test braided mainline on the smaller reels and up to 40lb or 50lb test on the larger reels, and then couple that with a 50lb to 70lb mono or steel leader – if you use steel, it’s better to go with black than silver. Also remember to set your drag at no more than 25% of the mainline rating. If you already own a good saltwater rated reel (a reel with stainless steel or ceramic bearings), you can bring that and buy a cheap rod at Wal-mart. It won’t have the feel of a high-end rod, but it will do the trick for beach fishing – even the small fish in the Gulf hit pretty hard. Another alternative would be to consider buying a reel that is rated for saltwater use. While most saltwater reels are expensive, I’ve found the Penn Fierce II 3000 and 4000 reels are good all-around choices for recreational saltwater fishing. They are both relatively light weight reels with the primary difference being line capacity. If you do a little searching on line, you can probably find them on sale for $50 to $60. First, you have to keep them alive. That means you’ll also have to buy a shrimp bucket with an aerator or change the water at least every 30 minutes (pretty easy to do – just dump and submerge the bucket) to keep the shrimp alive. Second, small “bait fish” like Pin Fish will attack live shrimp, which means in some situations it will be tough to keep your hook baited. While live shrimp are more effective for most situations, if you are just looking for some action, you can frequently catch Flounder, Lady Fish and Whiting with frozen shrimp. For live or frozen shrimp, I use a 1/0 or 2/0 Circle Hook. My favorite alternative for live shrimp is called FishBites. As a matter of a fact, since discovering FishBites I’ve quit using live or frozen shrimp. I use “Long-lasting EZ-Shrimp” in pink and flesh most of the time, but usually get one package of pink long-lasting EZ-Crab too. FishBite is inexpensive (about $6 for a package of two 12” strips). FishBites EZ baits look like a strip of bubble gum, but it is actually a tight synthetic fabric mesh that is covered with a scented material that is dry to the touch until it gets wet. After a couple of casts the scent will release as it softens and you will typically start feeling fish hit the bait. I like to order few weeks in advance of our trips directly from FishBites to insure it is fresh and get the best price. The last I checked, Dicks Sporting Goods in Sarasota carries FishBites – if fresh, it will be very flexible. I’ve seen FishBites at Wal-mart, but not consistently, so it’s best to call before you visit. Note: If Fishbites is stored in a refrigerator at the retail store, it will be stiffer, but when kept cold you can also be reasonably well assured it is fresh. With FishBites I like to use a Mustad Size 2 Bait Holder hook. The barbs on the shank keep the FishBites positioned a little better than on a Circle Hook, but a 1/0 or 2/0 Circle Hook will work well too. On a typical hook you only use about 1” to 1.25” piece (I like to thread the hook through three times). 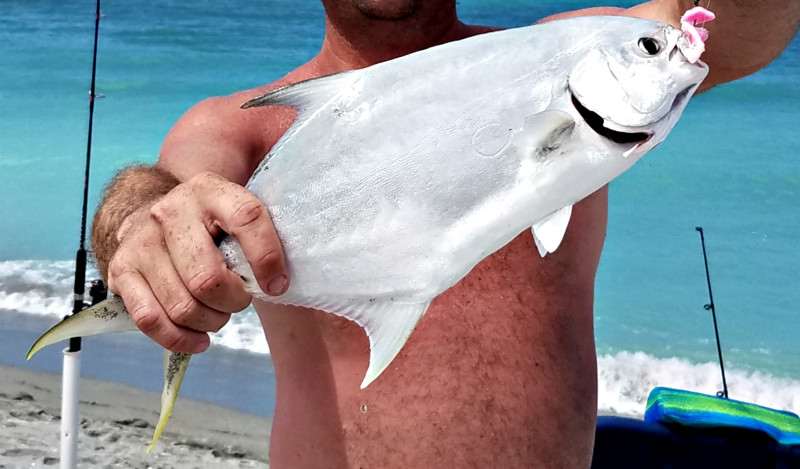 Don’t give up even if slightly more than half bait material is gone (you’ll see nylon mesh when the bait is gone) – I catch more Pompano on a well-worn bait than I do a fresh bait. When you are beach fishing you don’t have to cast far. 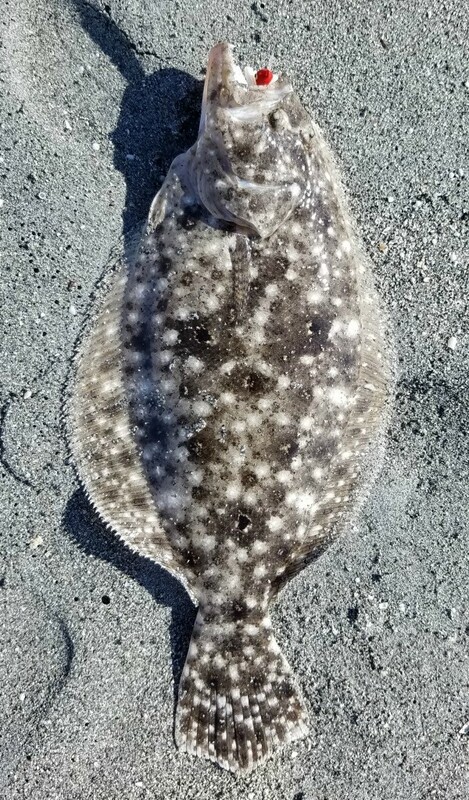 I typically cast out around 50 feet and then retrieve the bait through the dip that is between the sandbar and the beach where I frequently catch Pompano (you’ll know you have a Pompano or other members of the Jack family if the hooked fish moves rapidly from side to side), Sheepshead, Flounder, Lady Fish, Whiting, Catfish and occasionally Cobia and Snook (Snook and Lady Fish frequently jump out of the water once hooked – Pompano will occasionally jump too, but more often race from side to side). I also have good luck with 3 inch “Gulp” brand White Shrimp and 1/8th ounce chartreuse or red lead-head hook. This is often effective for Sheephead and Founder, which tend to hang out very close to shore. You can buy Gulp products at Wal-Mart, CBs and a variety of fishing tackle stores. If you use Gulp brand artificial bait it is VERY important to remove the bait from the hook when you are done fishing. If you don’t, it will harden overnight and be nearly impossible to get off in the morning. I don’t have any direct experience using lures, but local fishing fanatics tell me the most effective lures are the Yo-zuri Minnow (the black and silver color is usually especially good when the Spanish Mackerel are running), and the Clear Super Spook Junior. Spoons can also be effective from the beach – especially for Snook. My favorite is a silver Johnson Splinter. On windy days I like to use the half ounce Splinter and on calmer days, a quarter ounce. Generally the fishing is most active in the very early morning and just before sunset, but I’ve caught some of my best fish in the middle of the afternoon plus or minus an hour or so from high tide. Since the time between high tides is 12 hours and 25 minutes, the time for high tide will shift forward day to day. While you’ll find lower prices for tackle at Wal-mart, CB Saltwater Outfitters (info below under Boat Rental) and Economy Tackle are much closer and the people there will provide solid guidance. CB Outfitters is on Siesta Key (less than 3 miles from the condo), and Economy Tackle is on Highway 41; about four or five miles from the condo. You will find good guides at both places that will provide current fishing reports, suggest what tackle / bait has been effective lately. With only a few exceptions, you won’t need the classic “deep sea” rods or reels in our area – a heavy spinning rig is good enough for even the largest Tarpon. If you want to outfit for the big stuff, I suggest using at least 200 yards of 40lb or 50lb braided line coupled with 50lb to 70lb mono or fluorocarbon leader (fluorocarbon for Tarpon if the water is particularly clear). If you’re fishing for Tarpon be sure to use at least eight feet of leader and connect your leader to the main line using a Double-Uni or FG knot (FG is slimmest and strongest) so it can be reeled easily through the eyelets on the rod. 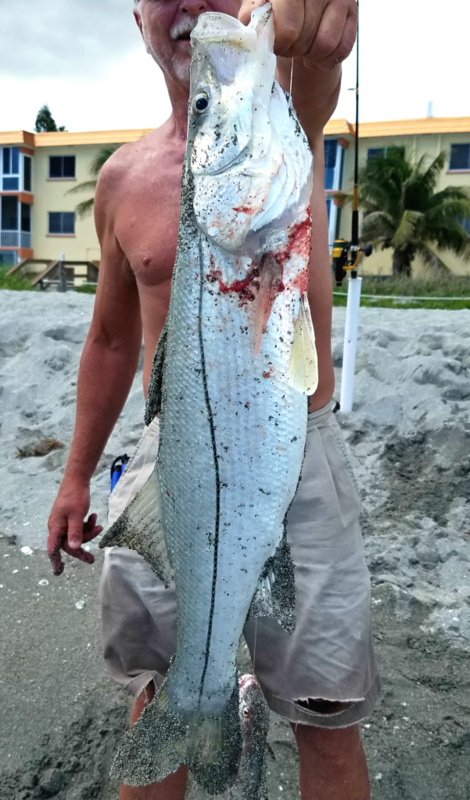 During the late spring, through the summer, and sometimes well into the fall, fisherman occasionally pull in large Tarpon from the beach. I hooked one during November using Pink Crab FishBites on a 7/0 Circle Hook, but didn’t get him in (if you land one out of five Tarpon hookups you’re doing pretty well). However, if you are serious about going after Tarpon, I strongly suggested chartering a boat and a captain (see below for more information). 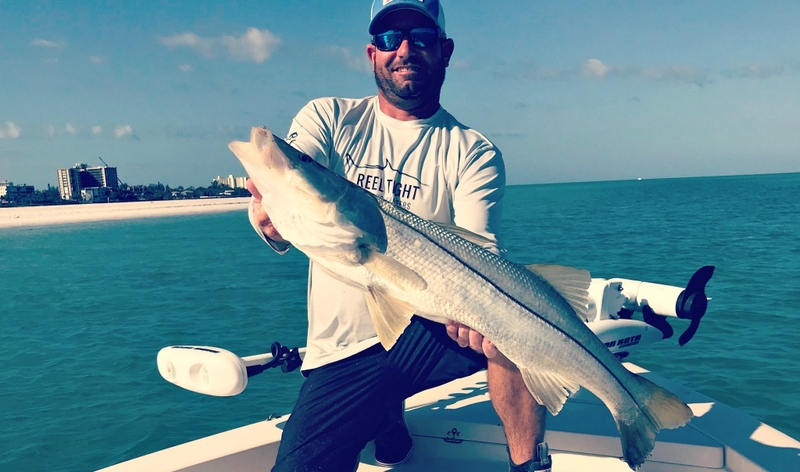 Snook can be found fishing off the beach in the spring and into the fall (when the water warms) – during the winter it is better to hire a guide or charter a captain and fish for them in the inter-coastal waters. During the winter you’ll often find Snook under floating docks and boats that have not moved in a long time. If you want to focus on Snook (great fighters), pick up a Johnson Splinter ½ ounce weight for only about $4 at CBs. It’s similar to a spoon, but a little different. If the Snook are biting they tend to hit this aggressively. The most effective bait for Snook is typically live bait fish (Pin Fish, Whiting, Mullet, etc.) and a 5/0 to 7/0 Circle hook. However, I’ve caught smaller Snook using a 2/0 Circle hook and EZ-Shrimp FishBites. 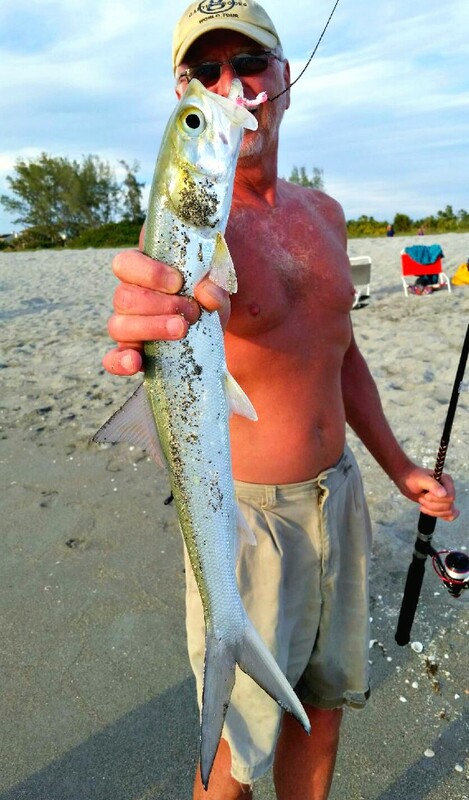 The Snook shown in the picture was caught off the beach using a 14” Whiting for bait (normally, I would shoot for 8” to 10”). I’m holding it vertically for a quick picture before lowering it so we could reach in its throat to carefully remove the hook from its gill (I would have cut the line if we couldn’t remove the hook it quick and clean) and get it back in the water. We were successful. I was thrilled how quickly it built strength and, after a couple minutes, swam away forcefully. There are a variety of regulations you’ll need to observe if you are fishing for Snook. You can read about those regulations and other license requirements by clicking here. I like to fish from the beach; mostly because I like to hang out on the beach and you never know what you might catch. While everyone loves to cast, you’ll discover that most of your bites occur 20 to 40 feet off shore. My largest Snook to date, which was about 39 inches, was caught only about 20 feet from the beach using a large live whiting for bait. There are a few exceptions to this general rule. Spanish Mackerel and Jack Crevalle frequent the channels between sand bars and Tarpon, which I’ve actually hooked from the beach, are typically beyond the furthest sandbar – usually 150 feet out or more. 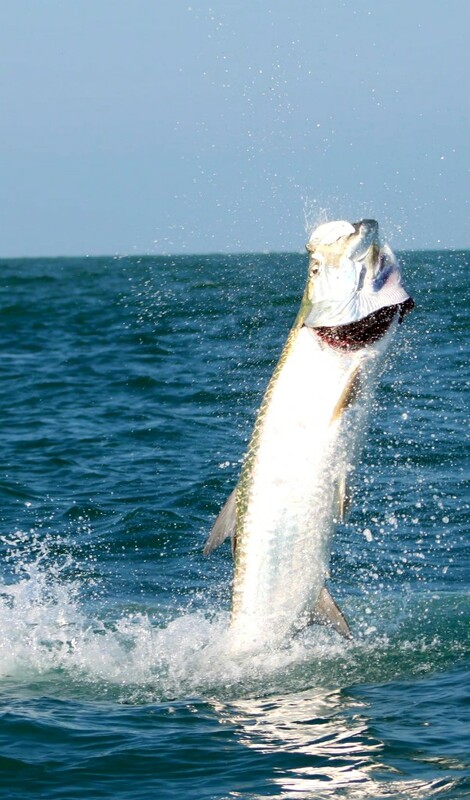 From mid-May through the summer, it is not uncommon to see Tarpon rolling between 150 and 300 feet off shore. If you prefer fishing from the piers / docks along the bay, you definitely do not need to cast far. As a matter of a fact, you’ll often have your best luck dropping a line right next to the dock. Think of the water as an ecosystem. Big fish hang out to ambush smaller fish and smaller fish hang out around structure and where they can find food. Predators like Snook often like to hang out in the shadow line by the piers and below floating docks like the kayak launch. 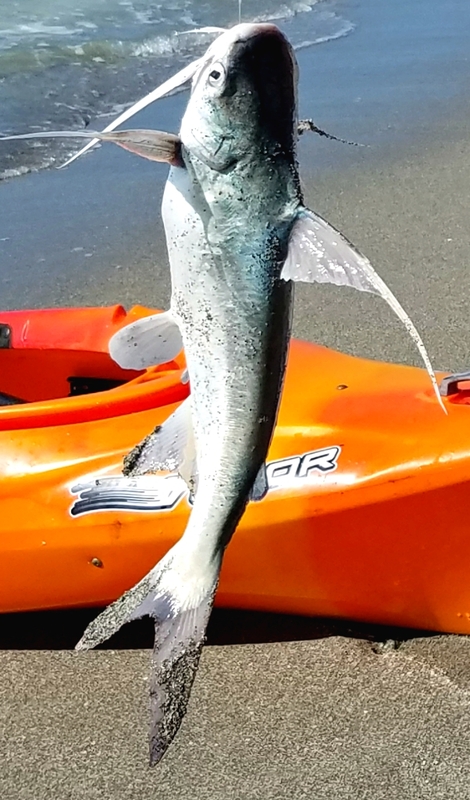 The piers, the mangroves at the north end of the parking lot and the floating kayak launch towards the south are all great places to find fish. In these areas you’ll typically have the best luck with live shrimp or scented plastics like Gulp or DOA shrimp or shad. You might have to move around a little to find action and you might even try using a bobber (float) to keep your bait off the bottom. If you rent a boat and are not using a guide, you should try setting a drift to cover the area south of Point Crisp (easy to find on the map the rental company provides). Also try fishing around older looking docks – the older the better, and around the edges of floating docks and boats that don’t look like they have moved in a long time. The latter is a good place to find Snook. There are three places to rent a boat that are between the condo and the Stickney Point Draw Bridge; Bayfront Marina is within walking distance while CB’s and Siesta Key Marina are about 2.5 miles north on Midnight Pass Rd behind Captain Curt’s – just east of Midnight Pass Rd on Old Stickney Point Rd – details are below. When I rent a boat I always closely inspect it for preexisting damage; including the propeller (prop). I document any damage with pictures and, if material, ask that it also be noted in the rental contract. While I’ve not encountered problems with claims that I’ve caused preexisting damage, it’s just a good practice. None of the three rental companies that are close by will allow you to take their boats into the Gulf and, last I checked, none of the three offer multi-day or weekly rentals. Since things can change quickly in the boat rental industry, it’s best to search for weekly boat rentals in Sarasota to get the most current information. I don’t have any direct experience with them, but BluWave Boat Rentals offers multi-day and weekly rentals and has boats that can be taken offshore (into the Gulf). As a bonus, BluWave will deliver your boat to the Turtle Beach Boat Ramp that is just north of our condo. Beyond the convenience, this will give you a good opportunity to inspect the boat while it is out of the water. 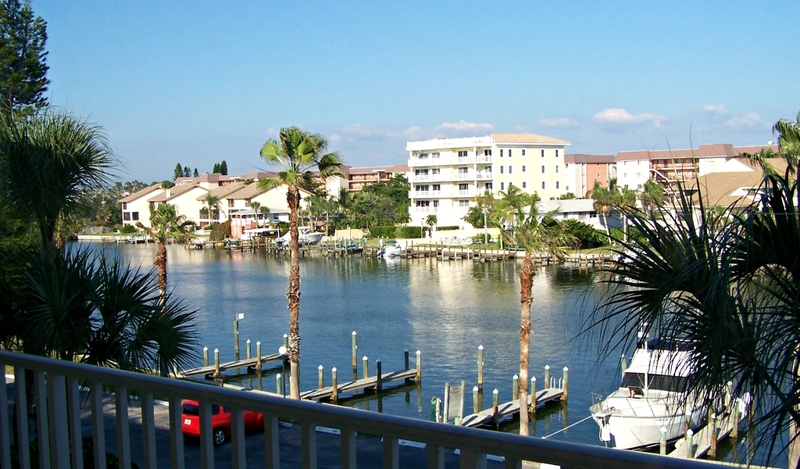 If you rent a boat for multiple days, you are welcome to use the docks at our condo for free. If you rent a kayak or canoe, you are also welcome to use the storage at the southeast corner of the complex, and our floating kayak / canoe launch ramp. Bayfront Marina (BFM) was formerly known as Turtle Beach Marina, but changed its name after being purchased by the company that owns Bayfront Excursions and Captain Jack’s, which are located in Sarasota Bay by downtown. BFM rents a variety of boats, kayaks, canoes, fishing equipment and has live and frozen bait. BFM can also arrange for a fishing guide or help you charter a boat and captain. The Siesta Key location was not offering JetSkis when I spoke with them, but that could change. CB’s has a large retail store that includes a wide variety of fishing equipment, tackle, live and frozen bait, clothing, etc. They also do reel repair work and will wind line you purchase onto your reel. CB’s offers a wide variety of boats for rent and can arrange for a guide or a charter. If you are going to CB’s from the condo, it is easier to access it from Old Stickney Rd, which is the street between Captain Curt’s and Crescent Beach Grocery. Siesta Key Marina (SKM) is located right by CB’s and offers a wide variety of boats for rent and can arrange for a guide or a charter. SKM carries tackle as well as live and frozen bait. SKM was the only place that stated it rents JetSkis when I called. There are many advantages to chartering a fishing boat and captain. Beyond the fact you will probably catch more fish, chartering is a turnkey experience – just show up with maybe a sack lunch or snack, and everything you will need for a day on the water is there – professional quality equipment, tackle, bait, cold water and with a licensed captain, there is no need to have a fishing license. If you plan to charter a boat and captain, I think it’s best to schedule it early during your stay. The advantage to taking the charter early is you will be able to apply the lessons you learn during the balance of your trip. I recommend Reel Tight Fishing Charters (RTFC). RTFC currently has three boats with experienced captains that are out fishing almost every day. As a result, they know the waters, the ecosystems and, most importantly, where the fish are biting. 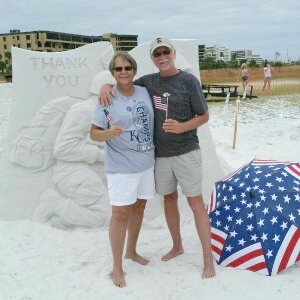 I do not receive any commissions from RTFC or any other business I write about, but the owner at RTFC assure me our guests will get a VIP treatment if they mention my name – everyone knows me as “Paul from Kansas.” It is best reserve in advance (they often book a week or more in advance) by calling 941-444-9749. If you’re an experienced angler, they will simply put you in the right spot and with the right tackle to catch the type of fish you want to target. However, if you want lessons or guidance, they are patient teachers and they love working with kids. RTFC also charters for fly fishing and will provide as much or as little guidance as you want. RTFC offers a variety of fishing experiences ranging from the quiet bay waters to the Gulf of Mexico. In my opinion, the main draw for going into the Gulf would be to target Tarpon (the “Silver King” as it’s often called) or maybe Grouper. Tarpon fishing is great beginning in mid-May through August, but remains a viable well into the fall (I’ve seen Tarpon in the Gulf in late November). There are also times when you can target Tarpon in the bay. If you’re not into going for Tarpon, I would consider a Bay fishing charter. The Bay water is smooth, and since RTFC captains are out daily, they know where to go for the action; particularly large Snook. Snook are the second most prized game fish next to Tarpon in the waters around Sarasota and Siesta Key. If you catch something that you want to enjoy for dinner, the RTFC’s Captains will clean, fillet and bag your fish for you and if you don’t want to cook, they will suggest a few local restaurants that will prepare your fresh catch for a small plate charge. RTFC also charters for Eco cruises, sunset cruises and tours. Prices vary by what you want to do. Here’s to hungry fish and tight lines!